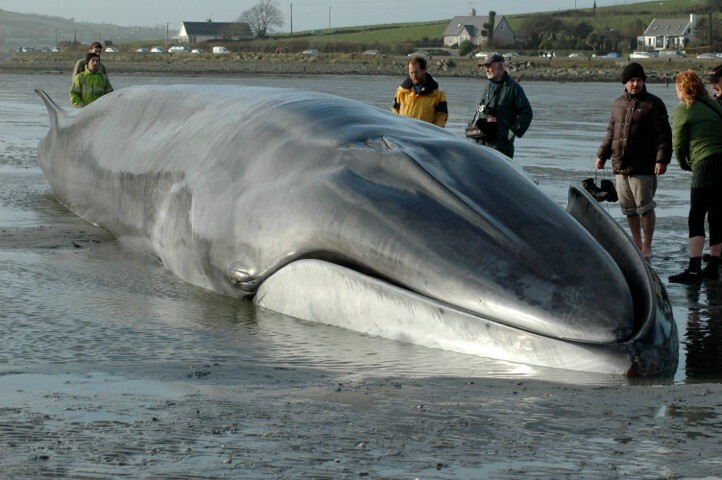 Scientists evaluating the deceased whale. Please call one of the marine mammal agencies listed BELOW to report a stranding. The links are grouped by region to make your selection easier. If you find a broken or outdated link, or know of an excellent related link which we are missing, please contact us. Do not touch, pick up, or feed the animal. Do not return the animal to water. Note physical characteristics such as size, presence of external ears and fur color. Note the animal’s condition. Is it weak or skinny? Does it have any open wounds? Look for any obvious identification tags or markings. Determine the animal’s exact location for accurate reporting. Call the local stranding hotline with as much information as you have. DO NOT attempt to return the animal to sea. They are there for a reason, usually sick or injured. Keep people and dogs away from the animal. Only 1 or 2 persons are needed until expert help arrives. Additional people will only add more stress to the dolphin or whale. If the animal is in the surf, support it upright and keep water out of the blowhole at all times. Keep the animal cool and wet by splashing water on the skin. Avoid getting water into the blowhole. Apply wet towels or t-shirts and provide shade if possible using tarps or towels. Keep the blowhole free of obstructions and take care not to cover any of its fins or tail. DO NOT apply suntan oil. If available, apply zinc oxide to the fins and tail. The dolphin’s skin is very sensitive and will sunburn severely. Be careful around the extremely powerful tail. DO NOT attempt to remove the animal or return it to the water. Seals and Sea Lions temporarily haul out on land to rest or dry out. Mothers briefly leave their pups while at sea. Observe the animal from a distance of at least 50 feet. Note the condition of the animal. Any obvious injuries? Is it bleeding? Wet or dry? Any markings or tags? Do not attempt to feed the animal. Do not pour water on beached Seals or Sea Lions. They are prone to respiratory diseases and wetting them down often adds to their suffering. Do not touch a stranded Seal or Sea Lion! Even though they appear friendly, they can inflict severe bites. They may also carry diseases communicable to humans. Control your pets. Keep people away! They could injure or be injured by a Seal or Sea Lion. Move the turtle above the high water line. Cover the animal with dry seaweed to prevent the wind from causing hypothermia. Mark the covered turtle with a gaudy piece of flotsam or jetsam, perhaps a buoy or anything unusual, so that rescuers will easily find the animal. Do not put it back into the water – doing so will condemn the animal to almost certain death. Do not remove the animal from the beach – a special license is required to transport federally protected species. Don’t touch it or try to catch it – it’s illegal, and sea otters can bite. Don’t pick up an otter pup that seems to be alone in the water – its mother is probably diving for food nearby. Keep people and pets away from the otter. Don’t wrap a stranded otter in a blanket – it will overheat very quickly. Wildlife rehabilitation specialists will come and determine whether the otter needs help. If it does, they will capture it and take it in for care. Remember, sea otters are wild animals and can deliver a severe bite! All Marine Mammals protected under the U.S. Endangered Species Act & the Marine Mammal Protection Act. Only authorized wildlife rehabilitators—like the agencies on this list—are allowed to catch or move them. Please call the NOAA Hotline (1-888-256-9840) immediately to report an injured or entangled marine mammal. Please report sightings in California of oiled otters, seabirds and other animals to the Oiled Wildlife Care Network Response Hotline: 877-823-6926. Call Dr. Melissa Miller at 831-469-1746 for all scientific inquiries and dead sea otter related issues. Call Jack Ames at 831-469-1740 for any California oil spill response and field problems.